The term “Graphic Design” was first coined by American designer, William Addison Dwiggins, almost 100 years ago in 1922 – although the actual practice of graphic design has been around for, well, pretty much for ever! So unsurprisingly, there are an abundance of books on the subject, such as some of our personal favourites, Know Your Onions, Graphic Design Rules and How To Be a Graphic Designer Without Losing Your Soul. Sell your used graphic design books for cash! No doubt if you’re a graphic designer yourself, or an individual interested in art, photography, typography or illustration, you’ll have a bookcase packed with graphic design books, some of which you may no longer want or need. Rather than letting them gather dust in your home, why not sell them to us? We make it super easy to say “goodbye” to your unwanted graphic design books and “hello” a tidier home… and to some extra pennies in the bank! Sell used graphic design books on the go with our mobile app! 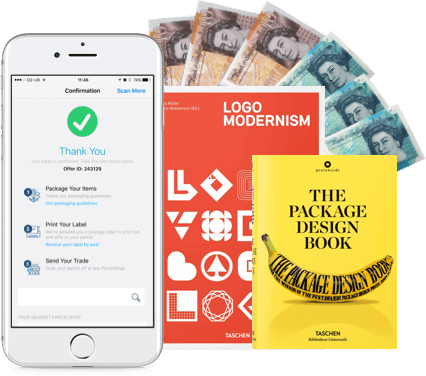 It transforms your phone’s camera into a clever scanning device, meaning you can get valuations for your used graphic design books whenever and wherever. So, even if you’ve got piles and piles of used graphic design books to sell, it won’t take you long to swap them for cash! Make the process even simpler with our clever app! 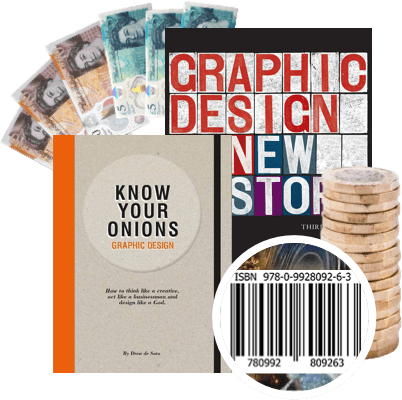 With our ingenious mobile app, you can get instant valuations for your used graphic design books by simply scanning the ISBNs with your phone camera. Next, you’ll send your books to us using a provided pre-paid postage label, and then you’ll receive your money the day after we have checked your items! You’ll be able to treat yourself to some new art supplies in no time. Can I sell used graphic design books with annotations? Here at WeBuyBooks, we understand that graphic designers are very visual people who may like to make a mark on their books… If you have some annotations in your graphic design books, or if some words are highlighted or underlined, don’t fret! As long as these do not cover more than 50% of any given page, are not on more than 20% of the book’s pages, and adhere to our item condition guidelines, we will be more than happy to buy them from you! 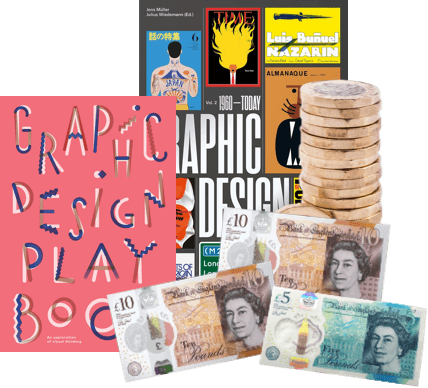 Send your Graphic Design Books, DVDs, games and CDs to us and we’ll send you some money. Less clutter at home and more money – what’s not to love about that? So don’t wait – sell online today with We Buy Books. If you’d like some extra help, then please don’t hesitate to get in touch. Just give us a call on 01706 248281.